As continuous printers have now become mainstream Kopykake is directing customers towards this type of printer. In the long term they will cease production of kartridges once stock is used and current kartridge printers have passed their expected life span. NEW – The Epson ET-2700 detailed below needs NO KARTRIDGES. This is now Kopykake’s preferred way to go. Printer price is initially higher but is quickly amortized when saving $110 per kartridge set. 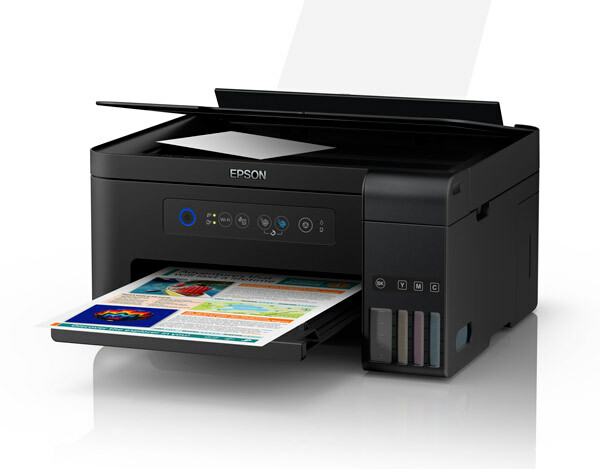 Epson now have a range of ET (Eco Tank) printers including an A3 size. Any of these are suitable for our refill inks. Customers can in fact choose any brand of any printer if they can acquire an after market continuous ink system for it. Melbourne company Rihac make many CISS systems for many printers. See their website www.rihac.com.au for details. Ensure you order your CISS system empty and then fill it using our edible refill inks. The Epson EcoTank Expression ET-2700 is a rear feeding, wireless all-in-one with an integrated ink system. NO KARTRIDGES REQUIRED. Ink is supplied continuously to the printer via tanks on the side. Simply keep these topped up with our refill bottles. This printer sells for around $400 – $450. You need to buy a refill kit from us to fill the reservoirs. Kopykake recommend that you print at least one page per day to ensure printer operates at optimum level. The ink cost for this is minimal as refill bottles are not expensive and last ages. Canon make a few A3 models – IX6860, IP7260 and IP8760. These models did take our C650/C651 kartridge set. They have rear paper feed (not illustrated in picture at left). They may need to be searched out as they are not usually ex stock in the main stream stores. WE ARE NOW OUT OF STOCK OF C650 KARTRIDGES AND THEY ARE NO LONGER BEING MADE. If you already own one of these printers then you will need to purchase an after market CISS system as detailed above. Epson XP-220, XP-320 and XP-420 take the T220 kartridge set. They cost between $60 and $95. These are multi function A4 scanner/printers with varying features. As at October 2017 these printers are now hard to find as they have been on run out for some months. Note that T220 kartridges come with ONE TIME USE chips and therefore cannot be refilled.